Spring is here (well, sort of). And the first scent of spring always brings an ustoppable urge to go fishing. Where? Not important. How? Not important. For what? Not important either. Since most lakes and streams are still frozen solid up here, early spring fly fishing in Scandinavia usually means fishing in the ocean for sea trout (sea run brown trout). Sea trout fishing in the ocean can be a tricky buisness (just look at this video). The ocean is huge. The sea trout isn´t. And to make matters even worse, there aren´t too many of them, either. So what this kind of fishing usually boils down to is casting some kind of big fly into the ocean for hours and hours, covering huge areas in search of your prey. 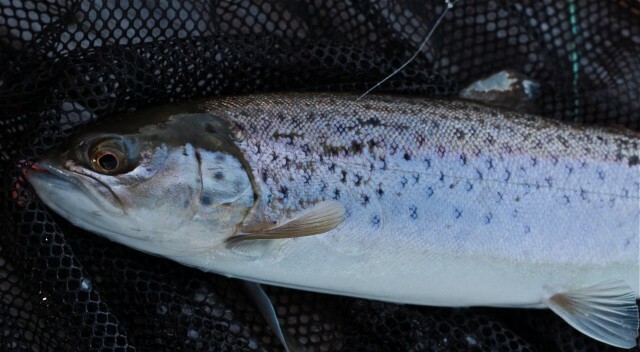 Once you do find the fish, it´s pretty straightforward – this time of year, most sea trout have just returned to the ocean after spending the winter months in freshwater, and they´re literally starving. Most of the time, they´ll attack anything that moves. But finding them can sometimes be a bit of a problem, especially if you don´t know the areas you´re fishing really well. For this year´s debut, I had high expectations. Fredrik Leth, an experienced sea trout enthusiast who co-runs the blog fiskesnakk, invited me to join him on a trip to some of the finest sea trout spots in south-eastern Norway. Once there, we would hook up with Knut and Kjetil from the blog Fluebanden. Both Kjetil and Knut are serious sea trout bums with extensive local knowledge and countless fishing days on the coast all year round. With fishing guides like these, catching a sea trout should be possible. It all started well. Fredrik picked me up at 06.00 saturday morning (! ), and as we sped down towards the silver coast, Knut and Kjetil reported over the phone that their dawn fishing session had been OK, with two decent fish landed already. Fredrik drove slightly faster. On arrival, the weather looked very promising: thin cloud cover, very little wind, +7 degrees and rising. Hands trembling, we tackled up and hurried down to the shore to meet Knut and Kjetil, who greeted us with some freshly brewn coffee. After the good fishing at dawn, things had slowed down for them, so the duo suggested trying a new place just a few hundred meters away. The place was a gorgeous sight for a sea trout fisherman: a large, shallow bay, wadeable all over, with several reefs and rocks creating little currents. The bottom was a mixture of sand, rocks, seaweed and clay. A textbook sea trout spot! A few casts later, what must have been a good-sized sea trout gave my fly a serious pull, and I started thinking that this was really going to be a trip to remember. However, an hour or so passed with absolutely no action at all, and the wind was really starting to pick up, so when a raving mad local lady came to chase us away (she obviously lives under the impression that she actually owns the sea), we decided to change location. At this point in my little story I have to go a little bit back in time. Three days, to be precise. At 4 AM on wednesday morning, the unpleasant but familiar sound of a human being throwing up awoke me. I looked left, at my wife. She was sleeping. I looked right, at my three year old son. He was not sleeping. To avoid going further into detail, I´ll just tell you that he had gotten what we call “Omgangssyke” in Norwegian. I believe it´s simply called “stomach flu” in English. Omgangssyke is a a harmless but highly contagiuous virus disease that causes symptoms similar to food poisoning. It´s very common among kindergarten kids, at least here in Scandinavia. I believe the proper name for the virus is Norovirus. Anyway, you get the picture. After my wife and I had taken care of my son, I must admit that one of the first three thoughts that struck my mind was “Damn it, I´m probably gonna get it, too, and then I won´t be able to go fishing on saturday”. Much to my surprise, I was still fit as a fiddle when Fredrik picked me up on saturday morning. Back to the story: While we were walking towards the car to drive to the next spot, I suddenly felt really sick and stopped walking. Ten seconds later, I was crawling around on the beach with a waterfall of vomit cascading out of my mouth, producing loud, guttural noises. Sick as a Dog. Most of the remaining part of the trip is covered in a kind of dreamy haze for me. We tried one gorgeous sea trout spot after the other, made thousands of casts, but had very slow fishing. The wind got worse and worse. Kjetil caught a thin trout on one of the spots – it probably came straight from the river – but other than that nothing happened. As for me, I tried to fish as much as I could, but had to take breaks every time I felt sick again, so my stamina wasn´t very good. And if there´s one thing you need in this kind of fishing, it´s stamina. An hour or so before sunset, we were back where we started. Fredrik and Kjetil decided to try a small, very shallow bay just by the parking lot. It sure didn´t look like much, with a road on one side and lots of boats and docks on the other, and since there wasn´t room for more than two or three fishermen there, Knut and I decided to try the same spots we fished earlier that morning instead. No luck. We fished for half an hour without a single pluck, so when Kjetil and Fredrik didn´t show up, we went to check if their luck was better. And it was! Their little bay was full of fish – mostly relatively small sea trout, but Fredrik had caught a beautiful fish around 1 kg. Mustering my last ounce of strength, I dragged my body onto a small dock and started casting. A few casts later, I felt a take, and a beautiful sea trout came to the net. Not a big fish by any means, but a decent sea trout in good condition, all silvery and beautiful. What a triumph! Victory at last. Totally beat, I just sat down to watch the other guys fish. The fish were feeding hard, and the guys had some action-packed minutes until the sun went down. It´s hard to draw any kind of moral from this story. Maybe it´s just a story of misfortune – being that sick on the first fishing trip of the season is definitely bad luck. On the other hand, I was really lucky, too: I got to meet Fredrik, Kjetil and Knut, who turned out to be really cool people. They generously took me to some of their best spots and provided me with the right flies (I owe you one, guys!). And I also caught a beautiful sea trout. On top of that I got to see some beautiful scenery and I got a very thorough body cleansing for free. What more can you ask for? I´m impressed by your ability to fish and puke at the same time! Interesting strategy – attracting fish by puking into the sea and then catching them when they come to eat. Yes, I´m quite proud of it, as I´ve never seen anyone else do it. Like all genius inventions, it came naturally and spontaneously to me. It raises some important ethical questions, though: Is this fair play? Is it really fly fishing at all? I don´t have the answers, but I´m more than willing to take part in the exciting debate.